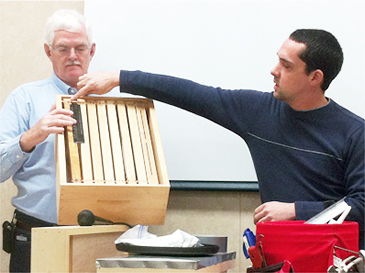 Trevor Qualls, of Bon Aqua Springs Apiaries and Woodenware, will speak on Natural Beekeeping at the Gardening Partners of Dickson County monthly meeting Tuesday, Jan. 14 at 7 p.m. at the Tennessee Technology Center at Dickson. Trevor is a member of the Nashville Area Beekeepers Association and the Columbia Area Beekeepers Association, and is Vice President of the Three Rivers Beekeepers Association. He lectures and speaks throughout Tennessee, Arkansas, Illinois, and Florida, and at Walter T. Kelley’s Field Day in Kentucky. He mentored under his friend John Seaborn, whose family has kept bees for over 100 years. John and Trevor continue learning and working closely together, extending themselves to assist beekeepers however they can. Trevor remains committed to chemical free beekeeping. Trevor and his wife Amy run a family owned and operated business located in the small, quiet community of Bon Aqua, Tennessee. For years working with wood has brought them great joy. After becoming beekeepers, they decided to begin making the quality, assembled woodenware needed by beekeepers. Their website is basprings.com.